Muscle mass – Since muscles require more energy and burn more calories than fat, someone who has a greater muscle mass will have a higher metabolism rate. Age – The younger you are, the more muscle you tend to have so your metabolism will be higher. As you age, fat usually increases while muscle decreases, causing metabolism to slow down. Body size – The larger you are, the higher your metabolism will be. 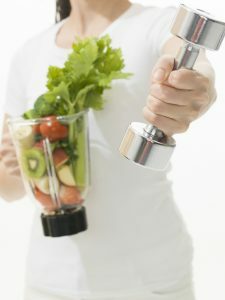 Gender – Men usually have a higher metabolism rate than women since they are typically larger and have more muscle mass. HIIT stands for high intensity interval training. It’s been a popular workout for a few years now primarily because it has been shown to be so effective in increasing metabolism and burning calories for hours after you’ve exercised. During a HIIT workout a person trains with low to moderate intervals interspersed with short bursts of high intensity intervals. In a Men’s Fitness article, exercise physiologist and athletic trainer Scott Weiss, C.S.C.S. said, “HIIT burns more calories during and after a workout than continuous aerobic training. The bursts of increased intensity simply increase the caloric expenditure, thus, more total calories are burned aiding in better body composition.” It delivers great results in a minimal amount of time. Check out this example of a HIIT abs workout. The more muscle you have, the higher your metabolism rate will be so be sure to make weight training a part of your exercise regimen. A Bodybuilding.com article states, “Weight training is the type of exercise which will typically have the greatest effect on your long-term metabolic rate.” You burn calories during your workout, while also increasing your metabolic rate for hours after. But weight training shouldn’t replace your cardio workouts. Aerobic exercise is an excellent calorie burner and you’ll achieve the best results if you combine cardio and strength training. While cutting back on excess calories is necessary to lose weight, lowering your caloric intake too much can actually put your metabolism into slow gear. You need to eat enough to keep your body functions working properly – and that includes your metabolism. This BMR calculator can help you determine how many calories you need to keep your body functioning at rest. Protein plays an important role in maintaining a strong metabolism. The amino acids in protein contribute to muscle growth, and more muscle increases your metabolic rate. If you are trying to build muscle, The Academy of Nutrition and Dietetics recommends that between 10 – 35% of your total caloric intake should be protein. It also notes that there is no benefit to eating more protein than this recommendation. Protein doesn’t mean just steaks and shakes either. This Eat This, Not That! article lists 30 of the best high-protein foods for metabolism with some surprising choices such as grapefruit and cocoa powder. Keep drinking that cup of joe. There have been numerous studies showing a correlation between caffeine consumption and increased metabolism. One study, cited in this Prevention article, showed that a cup of brewed tea can raise metabolism by 12%. Another study mentioned in Women’s Health found that people who drank caffeinated coffee had an average metabolic rate increase that was 16% higher than those who drank decaf. Start boosting your metabolism and get the scale to budge in your favor by incorporating some of the above into your lifestyle. Good luck! This information is not intended to be a substitute for professional medical advice. Always seek the advice of a qualified health provider with any questions about a medical condition or health problem or before starting a diet or exercise program. This website is for informational purposes only. It is your responsibility to evaluate your own medical and physical condition and to independently determine whether to perform any of the information or content on this website. By voluntarily undertaking any exercise discussed on this site, you assume the risk of any resulting injury.